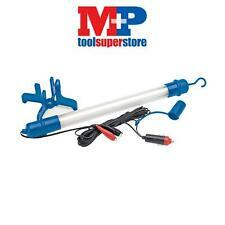 Flexible battery system as this torch will work with all Milwaukee M12 batteries. 90degree rotating head aims light at workspace. Sealed aluminium head impact and weather resistant. 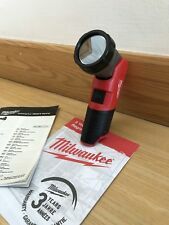 5 out of 5 stars - Milwaukee M12TLED-0 M12 12v LED Torch Cordless Work Light Body Only - WARRANTY! 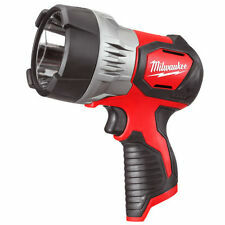 41 product ratings41 product ratings - Milwaukee M12TLED-0 M12 12v LED Torch Cordless Work Light Body Only - WARRANTY! Bosch 10.8v Lithium Ion LED Torch Bright Site Light GLI10.8-LIN Body Only Stock Code: GLI108VLIN GLI108LI Features Extremely bright light due to 1 Watt Power LED (laser class 2) Energy-saving running time for up to 7.5 hours Can be used with Bosch 10.8 volt batteries Unique Bosch Premium lithium-ion technology for 400% longer lifetime and unbeatable battery runtime Bosch Electronic Cell Protection (ECP): protects the battery against overload, overheating and total discharge Softgrip for ergonomic handling Bosch Hyper Charge: due to the rapid charging process, the batteries are charged to 75% after just half of the charge time No memory effect: the battery can be charged regardless of the charging state at any time, without damaging the cells GLI108LI Specification Barcode:. The Bosch GLI 12V-300 LED lamp brings light to poorly illuminated work places. It has a particularly thoughtful and practical design. A hanging hook allows you to suspend the lamp on a nail, handle or pipe etc. Or it can stand upright on its base. When laid on its side the hexagonal shape lets you direct the light; the shape also ensures the lamp remains stable. The lamp has 6 LED's offering an output of 300 lumens. Runtime is 190 minutes per Ah of battery power; 2.0Ah will give you 6 hours of illumination or 12 hours with a 4.0Ah battery. The GLI 12V-300 uses Bosch 12V Li-ion professional batteries; it is compatible with 12V or 10.8V batteries in this class. 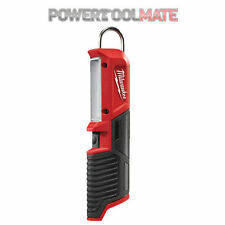 Milwaukee M12 Torch 12 Volt Bare Unit Not LED. Dispatched with Royal Mail 1st Class. 2 x M12B2 2Ah Batteries. 1 x Milwaukee M12MLED-0 12v Flashlight Torch. Milwaukee designed optic maximises performance, powerful LED can cast 350m. This does not affect your statutory rights. If you are not happy to proceed, or we are unable to obtain your instructions, we will cancel the order. Mon - fri 8:30am - 17:30pm, sat - 9:00am - 17.00pm, sun - closed. Angle Grinders. Circular & Plunge Saws. For use in places where mains power is unavailable. Supplied with 3M (approx.). of cable and connector for vehicle cigarette lighter socket. Manufactured from aluminium, 0.5W high power LED. Rotary switch, light mode on/off. Standard 12V Prefocus Torch Bulb. Standard Torch Bulb. Suitable for all 12V Torches. you will not be fobbed off with excuses, if we have failed to provide as stated we will start to rectify the problem straight away and. 2 X 12v Dewalt Torches Dw904 Used Condition. Condition is Used. Dispatched with Royal Mail 1st Class. Super bright LEDs: 2000MCD. impact resistant non-slip surface. Compatible with models 775-7286 and 775-7277. Spotlights & 12V Vehicle Search Lights - images are for illustration purposes only. Site Safety. Materials & Maintenance. View this range. Further Information. 10W COB (Chip on Board) technology for longer, more efficient power usage. 230V 500mA mains adapter. Long life 1800mAh lithium ion battery. This will enable us to assist you more thoroughly with your request and to deal with any difficulties. The flood light is easy to carry or put onto the ground with the stand or hanging for camping, fishing,hiking and many other outdoor activities. Beam Angel: 120 degree. Colour Temperature: 6000K. Portable and Lightweight work light, easy to carry or put onto the ground with the stand or hanging for camping, fishing,even if the back-up when it's power cut. SOLD BY AN AUTHORISED UK MILWAUKEE DEALER. Flexible battery system: works with all Milwaukee® M12™ batteries. M12™ fuel gauge with low battery indication. SOLD BY AN AUTHORISED UK MILWAUKEE DEALER. Flexible battery system: works with all Milwaukee® M12™ batteries. Compact design - operates in locations other lights cannot. 1 x Milwaukee M12MLED-0 12v Flashlight Torch. Milwaukee designed optic maximises performance, powerful LED can cast 350m. Sliding head allows to adjust the beam pattern from a flood to a spot effectively. Bosch GLI 12V-300 Work LED Light (Body Only). Condition is New. Dispatched with Hermes No battery. Expanding Foam & Backer Rod. Cordless LED Site. Re-Chargable Li-ion Cordless. Fireplace & Heat Products. Pressure Washer & Accessories. Safety & Workwear. Bird and Pest Protection. Surface Protection. 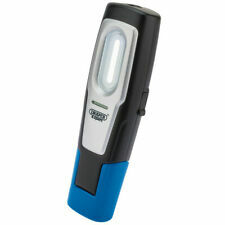 DC528N 12 or 14.4 Volt Flourescent Torch (naked). 1 xMilwaukee M12B2 2Ah Battery. 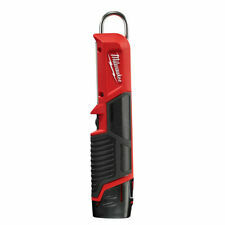 1 x Milwaukee M12MLED-0 12v Flashlight Torch. Milwaukee designed optic maximises performance, powerful LED can cast 350m. Hand wrist lanyard to keep the light safe and handy. 10w Work Light Inspection Lamp COB LED Swivel Spotlight Flood Torch Lithium. The flood light is easy to carry or put onto the ground with the stand or hanging for camping, fishing,hiking and many other outdoor activities. Using Micro CREE LED Energy-Saving Light Emission, Consumption is Equal to One One Tenth of an Ordinary Incandescent Lamp, CREE LED Life of 50.000 Hours at 100.000 Hours. - Flash light BL Lamp has Super CREE LED, Providing High-intensity Light LED Square Adjustable Zoom Focus Range From X1 To X2000. Draper type: 80964. An orange Draper Expert LED inspection lamp, perfectly suited to a host of industries, especially in the automotive sector. The base of the lamp features an integrated magnet and with two hanging hooks the torch can be mounted almost anywhere. 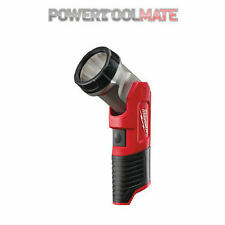 Swivel Spotlight Flood Torch Lithium. Beam Angel: 120 degree. 10w Work Light Inspection Lamp COB LED. Colour Temperature: 6000K. Specifications: Power: 10 watts. Powerful LED portable lamp for uniform, bright illumination of the working area. Lamp head can be tilted and locked in 12 positions. NS750 NS 750. 1 Million Candlepower. Spare spotlight bulb. 1 million candle power beam. 2 position handle. Amber quad flash. 4 light options. 100% intensity. Flexible, fast setup at the workplace due to powerful magnet, carabiner and hook. Brightness - 350 lx. Compatible with Bosch tripods (3/4"). Compatible with all Bosch 10.8-12V-LI batteries. Robust and efficient due to LED as light source.